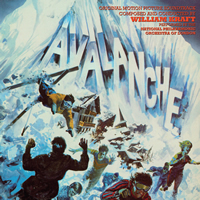 BUYSOUNDTRAX Records presents the original soundtrack to AVALANCHE, featuring music composed and conducted by William Kraft (FIRE AND ICE, THE CHISHOLMS) for the 1978 disaster film written and directed by Corey Allen, produced by Roger Corman, starring Rock Hudson, Mia Farrow, Robert Forster, Rick Moses, Barry Primus and Cathy Paine. AVALANCHE tells the story of a group of vacationers at an exciting new ski resort in the mountains of Colorado who are forced to face the brunt of Mother Nature’s wrath in the form of a powerful avalanche of snow. The film follows the efforts of the survivors to pull together despite their differences and stay alive long enough for rescue services to arrive. Released towards the end of a successful cycle of disaster films that included THE POSEIDON ADVENTURE and THE TOWERING INFERNO, producer Roger Corman was looking for a composer who could provide a large scale orchestral score for his film and he turned to composer William Kraft who, at the time, was building a successful reputation for himself as a composer and conductor, as well as a master percussionist with the Los Angeles Philharmonic Orchestra. For AVALANCHE, Kraft chose to center his score around the central conflicts of the film: Man’s destruction of his environment in his attempt to manipulate Nature instead of being one with it and the human relationships in the film. Performed by the National Philharmonic Orchestra of London, the composer deftly uses all the colors of the orchestra to highlight the dramatic elements of the story. BUYSOUNDTRAX Records presents the original motion picture soundtrack to AVALANCHE on compact disc for the first time, featuring music composed and conducted by William Kraft, performed by the National Philharmonic Orchestra of London. AVALANCHE contains the original 1978 album program assembled by the composer and also includes a selection of outtakes as bonus tracks, from elements in the composer’s archive, professionally mastered by James Nelson of Digital Outland.